Art of the arcade cabinet. Donkey Kong is an arcade game that was Nintendo's first big hit in North America. It marked the beginning of the Mario and Donkey Kong franchises, and introduced several of the earliest characters, including Mario himself (a carpenter rather than a plumber), the original Donkey Kong (who, in later games, would become Cranky Kong, the current Donkey Kong's grandfather), and Lady (later renamed Pauline). A version of the game was also created later for the Nintendo Entertainment System, Nintendo's first home console, under Arcade Classics Series. The game sold very well in the United States, becoming one of four games to be inducted into the Nintendo Hall of Fame. The original arcade version had four screen levels, but the Nintendo Entertainment System version only has three, with the stage 50 m cut. This game was also the first title to be released on Virtual Console. Donkey Kong was the second platforming game ever made; the 1980 game Space Panic was the first. Donkey Kong has kidnapped the beautiful Lady and taken her to a dangerous construction site. Mario must climb to the top of the construction site and rescue Lady from the giant ape. "HELP! HELP!" cries the beautiful maiden as she is dragged up a labyrinth of structural beams by the ominous Donkey Kong. "SNORT. SNORT." Foreboding music warns of the eventual doom that awaits the poor girl, lest she somehow be miraculously rescued. "But wait! Fear not, fair maiden. Little Mario, the carpenter, is in hot pursuit of you this very moment." Throwing fate to the wind, risking life and limb, or worse, little Mario tries desperately to climb the mighty fortress of steel, to save the lovely lady from the evil Mr. Kong. Little Mario must dodge all manner of obstacles- fireballs, plummeting beams and a barrage of exploding barrels fired at him by Donkey Kong. Amidst the beautiful girl's constant pleas for help, your challenge is to maneuver little Mario up the steel structure, while helping him to avoid the rapid-fire succession of hazards that come his way. As little Mario gallantly battles his way up the barriers, he is taunted and teased by Donkey Kong, who brazenly struts back and forth, beating his chest in joyful exuberance at the prospect of having the beautiful girl all to himself. It is your job to get little Mario to the top. For it is there, and only there, that he can send the mighty Donkey Kong to his mortal doom. Leaving Little Mario and the beautiful girl to live happily ever after. "SIGH. SIGH." So, if you want the most exciting, most fun-filled, most talked about family video game on the market, don't monkey around with anything but the original Donkey Kong. Donkey Kong stars Mario attempting to reach the top of a construction site where Lady is held captive. He can walk along platforms, jump, and climb ladders as well. In the process, Donkey Kong may attempt to hinder Mario from a higher location by sending obstacles at him. Mario has the ability to jump over these obstacles or obliterate them using a Hammer; in both cases, he obtains a number of points that are added to a score. However, if Mario ends up falling off the side of a platform and lands on one below him (or none), and the difference in height is greater than Mario's by one and a half, he loses a life. Each time Mario reaches Lady, Donkey Kong will carry her away on a pair of ladders to the next level until the fourth stage, where he is defeated upon completion. Mario 25 m A carpenter, Mario serves as the protagonist of the game, possessing the ability to jump over obstacles and wield hammers. Certain materials for the arcade version use the alternate name Jumpman. Lady 25 m The damsel in distress, held by Donkey Kong at the end of every level. The western NES port changed her name to Pauline. Donkey Kong 25 m The main antagonist, Donkey Kong appears in every level at the end of each stage, throwing obstacles at Mario or guarding Lady. This particular Donkey Kong is later revealed to be a younger Cranky Kong. Barrel 25 m Barrels are thrown by Donkey Kong throughout 25 m. Mario can easily jump over these barrels, or destroy them with a Hammer. Certain barrels appear to be blue, which will spawn a Fire if they reach the Oil Drum at the beginning of the stage. Fire 25 m Sentient flames that follow Mario, even climbing up ladders. They spawn from Oil Drums located amongst each stage and can easily be defeated with a Hammer. Larger versions that are harder to jump over also make an appearance in 100 m.
Cement tub 50 m Cement contained in blue tubs. They are moved along conveyor belts and defeat Mario if he touches them. Jack 75 m Springs that appear in 75 m. They bound from where Donkey Kong stands before falling straight down when it reaches an edge. Hammer Hammers can defeat all enemies in the game. As soon as Mario grabs a hammer, he starts swinging the hammer back and forth repeatedly, and strikes anything in his path. While holding the hammer, Mario cannot jump. After a certain time, the hammer disappears and cannot be used again. Parasol, Hat, Bag For each of these items Mario takes, he will gain a point bonus. After completing the fourth screen, 100 m, the player has reached the next level, which starts at 25 m again, but with increased difficulty like more frequent barrels and faster fireballs. Although the game is intended to be playable indefinitely by not having a level cap, it is impossible to complete the first screen of level 22, due to a glitch within the process of calculating the time limit. Said time limit is calculated using the formula (10 × level number) + 40 and shown in hundreds as a bonus counter in the top right edge of the screen. Because the calculated value is stored as an 8-Bit integer, which can only save 256 different values ranging from 0 to 255, and the formula results in a value of 260 for level 22, an integer overflow occurs and the value is saved modulo 256, which means 260 is saved as 4. This leads to a starting value of 400 for the timer of level 22, so that Mario dies a few seconds after starting the level, being unable to finish it. Donkey Kong was created in late 1980 when Shigeru Miyamoto, under the supervision of the late Gunpei Yokoi, was assigned by Nintendo to convert Radar Scope, a poorly selling arcade game in North America, into a game that would have more appeal to more gamers. Shigeru Miyamoto later admitted that he did not focus on the story of the game, instead creating a basic plot with colorful characters and music that he himself penned. He said that Mario and Lady were not intended to have a relationship, and he did not know where the idea came from, but he thought that it did not matter much. The game was also originally designed to have Mario escape from a maze, and jumping was not yet implemented, making platforming too difficult. In a time where arcade games took around two to three months to build, Donkey Kong was built in four or five months and Shigeru Miyamoto was focused on developing it for a global market rather than just for Japan. The final version of the game was a major breakthrough for Nintendo and for the video game industry, becoming one of the best selling arcade machines of its time. Its platforming gameplay also distinguished it from most other arcade games at the time. Donkey Kong was originally conceived as a Popeye game, with Bluto being in the spot of Donkey Kong, Popeye being Mario, and Olive Oyl being Lady. The game ended up being changed due to Nintendo being unable to secure the license for Popeye at the time. Nintendo would later secure a license, making the Popeye arcade game a year later in 1982. Miyamoto envisioned Mario to be a young man at around 24 or 26 years old, describing Donkey Kong as Mario's pet who escaped and kidnapped his girlfriend. In 1982, around a year after the game's release, Universal Studios sued Nintendo, claiming that Donkey Kong infringed on Universal Studios's intellectual property rights to the film King Kong. Howard Lincoln, attorney and future president of Nintendo of America, decided to fight the case and hired seasoned attorney John Kirby to represent Nintendo. When Kirby showed that not only was Nintendo not in violation of any copyrights, but also that Universal Studios themselves had sued RKO Pictures in 1975 to prove that the plot of King Kong was in fact in the public domain, Judge Robert W. Sweet ruled in Nintendo's favor, ordering Universal to pay Nintendo $1.8 million in legal fees. In an ironic twist, Judge Sweet also ruled that Tiger's King Kong video game, licensed by Universal, infringed on Donkey Kong. After the victory, Nintendo awarded John Kirby with a $30,000 sailboat, christened the Donkey Kong, and gave him "exclusive worldwide rights to use the name for sailboats." Crazy Kong was an officially-licensed clone of Donkey Kong manufactured by Falcon. On June 30, 1982, Nintendo of America filled a complaint toward Elcon Industries Inc., an arcade hardware manufacturer based in Michigan that sold Crazy Kong boards. The complaint alleged that the licensing agreement with Falcon explicitly forbade the manufacturing or export of Crazy Kong outside Japan. The case was taken to the United States District Court for the Eastern District of Michigan, which quickly ruled in favor of Nintendo. As Nintendo's newly established video game division lacked programming manpower, the arcade version of Donkey Kong was programmed by Ikegami Tsushinki, a contractor that had worked for Nintendo for several of its arcade releases. For Donkey Kong's development, the two companies signed a contract which gave Ikegami Tsushinki exclusive rights to the manufacturing of Donkey Kong arcade boards. In 1983, Ikegami Tsushinki sued Nintendo on the ground that the company had violated the contract and produced around 80,000 arcade boards on its own. Ikegami Tsushinki also sought compensation for the use of reverse-engineered Donkey Kong code in Donkey Kong Jr. and claimed it owned the copyright on Donkey Kong's code (while the contract did not specify ownership of the code, a judgment relating to Space Invaders Part II set a precedent establishing computer code can be copyrighted). In response, Nintendo claimed it owned Donkey Kong's code as Ikegami Tsushinki was hired as a sub-contractor. The case went to the Tokyo District Court until March 26, 1990, at which point the two companies settled out of court. The lawsuit has often been stated to be the reason behind the lack of rereleases of the arcade version of Donkey Kong and the existence of Donkey Kong Original Edition, although Donkey Kong 64 nevertheless features a full port of the arcade version, albeit with slight differences as it closely imitates the source code. In 2007, a documentary film directed by Seth Gordon based off Donkey Kong was released. The film centers around high school teacher Steve Wiebe as he tries to achieve a world record for obtaining the highest score in the game, which is held by Billy Mitchell at the time. Poster advertising the first sequel, Donkey Kong Jr.
50m and most cutscenes have been removed. Only one level appears. This level only has three floors, and Mario has to reach the top four times. GBA as Classic NES Series: Donkey Kong. This version, as the title implies, is not based on the arcade version, but rather the NES version, meaning 50 m is also omitted. Family Computer Disk System Similar to NES version. 50m and 75m have been cut out. The game has much simpler graphics. Only one Hammer appears instead of two. Donkey Kong does not throw the barrels, but they are automatically spawned. Fires and blue barrels do not appear. In 100m, four large Fires spawn automatically, though additional Fires do not spawn. Cutscenes are also absent. 50m has been cut out. The graphics more closely resemble the original game than the system's predecessor. In 25m, blue barrels do not appear, and are instead replaced by barrels that go sideways. Pauline's hat does not appear in 75m. In Game & Watch Gallery 2 and Game & Watch Gallery 4, Donkey Kong was one of the minigames. It could be played in both modern and classic modes. Two different ports of Donkey Kong have appeared on Virtual Console. The first, released in 2006, is essentially a direct port of the NES version, while the second, entitled Donkey Kong Original Edition (ドンキーコング オリジナルエディション), attempted to adhere to the arcade version, and was pre-installed for the European release of the Mario 25th Anniversary limited edition red Wii in 2010. This version restored some missing animations and the level 50 m, which was cut from the NES version, although Donkey Kong mistakenly stands still in this level, and while the port's graphics are an improvement to the NES port, it is still inferior to the true arcade version, which remains unavailable on Virtual Console. The latter port was made available on the Nintendo eShop in Japan when a Club Nintendo member purchased the download version of one of two games, one of which was New Super Mario Bros. 2, from July 28, 2012 to September 2, 2012. A similar promotion took place in the US between October 1, 2012 and January 6, 2013, exclusively to members of Club Nintendo who have, within the aforementioned time frame, linked their systems to their Club Nintendo accounts and have purchased the downloadable version of one of five select 3DS titles (one of which was Paper Mario: Sticker Star). There are currently no plans for a wide release of this version in the U.S., although it was released in Europe for the 3DS eShop on September 18, 2014. The NES and Famicom version of Donkey Kong is one of the 30 games included in the NES Classic Edition and Nintendo Classic Mini: Family Computer, respectively. The NES version, with added online play, was one of the 20 NES titles made available at the Nintendo Switch Online subscription service's launch in September 2018. The game eventually came out for the e-Reader as part of Series Two. Pauline's been kidnapped by Donkey Kong! She awaits your help at the top of the steel girders–can you rescue her from the ape's clutches? There are three levels to clear before Mario is reunited with his sweetheart. After that the game loops and gets progressively more difficult. Rounds 1 and 2: Mario has to climb to the top of the structure where Pauline awaits. Donkey Kong throws fireballs, Jacks and Barrels to foil you! Round 3: Mario must undo eight bolts by running over them. This will cause the collapse of the structure and the downfall of Donkey Kong! You can gain points by picking up Pauline's lost parasol and purse. It pays to be alert! You get an extra life if your score exceeds 20,000. Gain points by bonking a Barrel or Fireball with your Hammer. You also get points if you successfully jump a Barrel. Bonus points are added to your score when you reach Pauline. But if you take too much time to reach her, these points will decrease. The sooner you finish the level, the better! Take advantage of jumps. Use your jumping skills to avoid Barrels, Jacks, and Fireballs. Pauline's waiting! You can jump left, right, or upward. Press the + Control Pad in the direction you want to jump as you press the A Button. Note that Mario cannot jump on or off the ladders. Mario can jump the distance of two sections of the steel girders. He can only survive a jump down the height of two sections of the steel girders– the same as Mario's height. Level 1: Two Hammers are on this level. Each can be used only once. Find the right place, grab it, and use it to bonk Fireballs and Barrels! Level 2: The Jacks come down on a set course, so they're easy to avoid. Wait in front of the position where the Jack will bounce. After it passes, its safe to move on. Level 3: Undoing the bolts needs to be done quickly because the number of attacking Fireballs increases. The best way to proceed is to go from the lower left upward and then from the upper right downward. Announced at E3 2018 and released as part of Hamster Corporation's Arcade Archives brand, a port of the original arcade game titled Arcade Archives: Donkey Kong was released on the Nintendo Switch's eShop on June 14, 2018, marking the first official release of the full arcade version of Donkey Kong since its original release 37 years earlier. The player can choose between playing the original Japanese release, the later Japanese release, and the international release of the game. The arcade version was produced by Gunpei Yokoi. Shigeru Miyamoto and Hiroshi Yamauchi directed the game while an uncredited Ikegami Tsushinki did programming duties, later leading to a lawsuit over which company owned the arcade code's rights. Intelligent Systems' own website claims credit for developing the NES port for Nintendo, though neither the cartridge nor title screen mentions the company and the Iwata Ask interview released for New Super Mario Bros. Wii states the game was developed by Nintendo Research & Development 2. Landon Dyer programmed the DOS Version. Although Ikegami Tsushinki is uncredited, a 1996 article published in Bit Magazine and written by one of the programmer involved, Hirohisa Komanome, reveals the name of the programmers who worked on the game. For this subject's image gallery, see Gallery:Donkey Kong (game). Opening - The opening cutscene theme. How High Can You Get? - Music that plays when starting a level. 25m - Music that plays in the first level. Lose a Life - Music that plays when killed, or running out of time. Hammer - Music that plays when using the hammer. Level Complete - Music when completing a level. 100m theme - The theme that plays in 100m. Donkey Kong Falls - Music heard when Donkey Kong falls down. Ending - The end theme. Title Theme - The Title Screen's theme. Super Mario Bros. 2: Clawgrip tosses down rocks and beats his chest in a similar manner to Donkey Kong in this game. Donkey Kong (Game Boy): The four levels from the arcade version of this game are remade in this game. The Hammer and Pauline's dropped items also appear. The plot is also identical for the first four stages. Donkey Kong Country: Cranky Kong, who is stated to be an elder version of the original Donkey Kong, uses a phonograph and plays the title song from the NES version of this game in the intro, on a structure made of girders resembling the ones from 25 m. The oil drums from Oil Drum Alley are the same as the ones in 25 m.
Donkey Kong Country 2: Diddy's Kong Quest: Cranky's line, "Whisking off maidens and chucking barrels seven days a week, I was!" is a direct reference to this game. Super Mario RPG: Legend of the Seven Stars: One of the challenge rooms in Bowser's Keep late in the game involves Mario having to dodge barrels thrown down by a Chained Kong. Super Smash Bros.: The Hammer appears as an item in this game. Donkey Kong's red costume and Mario's blue costume in this game are based on their respective original sprites in Donkey Kong. In addition, although not in the game itself, the Nintendo Power ad for the game indirectly alludes to Mario and Donkey Kong's origins as rivals by mentioning off-handedly that Mario and Donkey Kong have not "duked it out" for more than a decade. Mario Golf: One of Wario's alternate costumes is based on Mario's original outfit. The arcade machine found in the Frantic Factory. Donkey Kong 64: A direct port of the arcade game is playable by accessing an arcade machine in Frantic Factory. The song that plays in Creepy Castle is also a remade version of the music that plays when Donkey Kong is climbing up the construction site with Pauline. A red girder which looks similar to those from 75 m can also be seen inside DK's Tree House. Paper Mario: The opening theme plays when confronting the Koopa Bros. in Koopa Bros. Fortress, followed by the Koopa Bros. theme. Donkey Konga: When choosing to display in 50hz or 60hz, Mario's sprite acts as the cursor; Donkey Kong's sprite can be seen to the left. WarioWare, Inc.: Mega Microgame$! : There is a microgame based upon this game in which the player as Mario must jump over barrels. Mario & Luigi: Superstar Saga: If Mario jumps when the Border Bros tell Luigi to jump, one of them says, "give the jumpman thing a rest", a reference to Mario's alternate name from the arcade version. Mario rescues Luigi at Woohoo Hooniversity by traversing a stage with rolling barrels. There is also a skeletal pirate named Bink who tosses barrels in the Barrel minigame. Paper Mario: The Thousand-Year Door: One of the badges in this game is the Jumpman badge. In addition, if the player returns to the Glitz Pit and reaches first place again, one audience member says, "JUMPMAN!!! Wait, who?" Mario Power Tennis: The music that plays when Donkey Kong wins a trophy is the title theme from this game. Donkey Kong Jungle Beat: During the fights with Ghastly King and Cactus King, a portion of their battle music consists of the music that plays when Donkey Kong takes Pauline up the construction site. Donkey Konga 3: Tabehōdai! Haru Mogitate 50 Kyoku: One of the songs from this game is featured. Mario Party 7: One of the DK minigames is called "Jump, Man", and requires navigating up a series of ramps and vines over a series of falling barrels. Toadsworth even notes the similarity to the gameplay of Donkey Kong. Mario Hoops 3-on-3: Mario's baller name in this game is "The Jumpman". Baten Kaitos Origins: The character Guillo when meeting Gibari directly references the premise of the game when sarcastically asking "What are you, some monkey who's run off with a pretty wench?" upon seeing the latter throw a barrel at guards. Donkey Kong Barrel Blast: The theme of Cranky's flight school and part of Cosmic Highway feature this game's opening theme. Super Smash Bros. Brawl: 75 m appears as a stage in this game. The title theme appears as a cover version in this game, and the 25 m theme also appears in its original format. A demo of this game is also available as a Masterpiece. 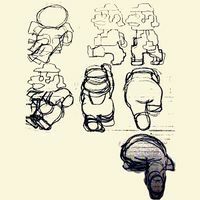 Mario's down taunt, in which he spins around in midair and falls on his back, is a reference to his dying animation in this game. Also, one of Wario's costumes is based on Mario's outfit from his first appearance and one of Peach's alternate costumes is based on Pauline's original appearance. Pauline and Donkey Kong also appear as a sticker, using their original artwork. WarioWare: D.I.Y. Showcase: There is a microgame based upon this game in which the player must destroy a barrel rolling toward Mario by tapping it. The microgame's description also refers to Mario as Jumpman, which was changed when the microgame returned in WarioWare Gold. New Super Mario Bros. Wii: Broozers can knock around barrels, similar to Donkey Kong in this game. Donkey Kong Country Returns: The 25 m stage can be seen in the background of Foggy Fumes. A statue of the Donkey Kong sprite from this game holding up a Wii Remote can be seen in Wonky Waterway. Some of the secret temple stages feature paintings on pillars and platforms resembling the stages from this game. Super Mario 3D Land: Part of the final battle with Bowser features Bowser moving from side to side and tossing barrels at Mario in a similar manner to Donkey Kong in this game. Donkey Kong Country: Tropical Freeze: Donkey Kong's sprite can be seen holding a Wii U GamePad at the end of Aqueduct Assault. Captain Toad: Treasure Tracker: The music played and animation when the player picks up a Super Pickaxe are identical to when Mario grabs a Hammer in this game. Also, the level Retro Ramp-Up is based on this game, but replacing Donkey Kong with a Spike throwing spiked balls. Super Smash Bros. for Wii U: 75 m returns as a stage. This game is also once again featured as a Masterpiece. Pauline appears in the form of a trophy. In addition, the ending of Pac-Man's debut trailer, "Red, Blue, and Yellow", subtly referenced the game by showing Mario and Donkey Kong slightly off screen with arrows pointing to them with the year "1981" on top while Pac-Man and Mr. Game & Watch were quarreling. Super Mario Odyssey: Mario's original outfit appears as the Classic Suit for Mario. Red girders appear in the Metro Kingdom (which is a reference to the Donkey Kong series) and are in a few parts of the city. Many of the billboards use art from the arcade cabinet, and Pauline and Donkey Kong's original designs appear as graffiti art on a building as well. The license plates for the taxi cabs also read "1981-ND", a reference to the year Donkey Kong released. In an 8-bit segment using sprites from Donkey Kong in the Metro Kingdom, Mario must climb girders while avoiding barrels. Oil Drums also appear, along with coins spelling out "DK". The music for 25 m can be heard in "Jump Up, Super Star! ", as well as during the ending cutscene variation of "Break Free (Lead the Way)". Also, the sound effect that plays when Mario jumps over a barrel can be heard in the aforementioned riff. Mario + Rabbids Kingdom Battle: The Phantom mentions Donkey Kong in his song. In an area of the Donkey Kong Adventure DLC, a stone structure resembling the 25 m stage can been seen, where a Rabbid is found jumping over barrels that another Rabbid is throwing while imitating Donkey Kong's movements and the 25 m theme plays in the background. Beep-0 remarks that the Rabbid would be lucky to get to 125 meters unless he finds a Hammer. Super Smash Bros. Ultimate: 75 m returns as a stage yet again. Donkey Kong and Lady appear as a Legend-class spirit, using their original artwork. Even though Mario wears his signature red and blue clothing in the game, he wears blue and white clothing on the box art for the NES port. Nintendo Power distributed an original Donkey Kong arcade cabinet as the grand prize for the Classic NES Series sweepstakes. In 1982, Buckner and Garcia recorded a song titled "Do the Donkey Kong", using sound effects from the game, and released it on the album Pac-Man Fever. ↑ Sheff, David (1999). Game Over: Press Start to Continue: The Maturing of Mario. Wilton, Connecticut: Gamepress. Page 126. ↑ Nintendo Entertainment System – Nintendo Switch Online. Nintendo. Retrieved May 8, 2018. ↑ Hirohisa Komanome, ドンキーコング・池上通信機器事件, web transcript published on December 26 2002. Retrieved April 21, 2016. This page was last edited on April 8, 2019, at 09:44.